by Blas Delgado Ortiz, 19 Aug 2001, after image by Petr Exner; flag adopted 13 Jun 1995; design: Theo George. 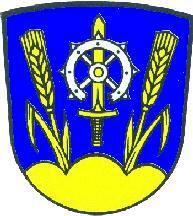 When the new coat of arms and flag of Bolatice was designed the original symbolism of the Bolatice seal was neglected. The designer, Theo George from Germany, combined the attribute of St. Stanislas (sword), the patron saint of the present church, with the one of St. Catharine (wheel with knives), on whose nameday the extended church was inaugurated in 1912. To these symbols were added the corn-ears for agriculture. By the decision of the chairman of the Czech Pariament # 56 of 13 Jun 1995 a coat of arms was adopted "blue with a golden sword between two golden corn-ears issuing from a threemountain, surmonté a broken silver wheel, supplied with knives". The flag is vertically blue-yellow; on the hoist is the sword with the broken wheel. Source: This webpage, reported by Martin Markovič.